Cabin needs hooks on bathroom & bedroom doors to hang bathrobe. Needed paper plates & Kleenex. Some lightbulbs were missing. You need garage can with secure lids. Animals got into it & made a big mess. We were given the wrong wi-fi passcode but problem was fixed. Never could figure out how to work fireplace. It was nice to have a washer & dryer. That was a big plus. Swing & rocking chairs were really nice. Overall we would come back & we will recommend Cabins USA. My family and I enjoyed our stay at Brentwood. The cabin was very clean but could use some updating for sure. The beds were not very comfortable and the ceiling fans squeaked. The hot tub was not working when we arrived. I called Cabins USA and the maintenance people had it fixed by the next morning! They were very nice about it. Plenty of towels and wash clothes for all of us. My main complaint as i said, the owners could do some updating. The property is in a convenient location also. I would much rather there be a pool table than an small arcade like gaming unit in the "game room". It is a small room, but pool would be better than the gaming system. In my personal opinion, the bed in the left upstairs room was uncomfortable, but everyone else in my group said they were the most comfortable beds they have slept on in a long time. I would love for there to be HDMI compatible TV's in the bedrooms because not everyone wants to hook up their game systems in the main living area. The shower head in the right bathroom upstairs needs to be replaced because it is loose and you can't adjust at all. Otherwise, great place to stay and would recommend and possibly stay in again. Very nice and clean cabin at a reasonable rate. The check in was very easy and the Cabins USA staff was very friendly and helpful. The beds were comfortable and plenty of towels and wash cloths for eight people. I will definitely use Cabins USA again in the future! Thanks Cabins USA for a pleasant stay in Pigeon Forge! This cabin has a lot of steps, so I would not recommend to anyone who has difficulty walking or climbing steps. The flooring in the master bathroom needs replacing. Cabin was clean and the furnishings were adequate. The security lights on the corner of the house were not working which made it very dangerous climbing the many steps in the dark. This cabin was wonderful a few down falls ... the stairs oh my...but once inside it was very relaxing and welcoming. The hot tub like many other reviews for this property would not stay heated the jets barely worked. Called it in and they tried to help solutions over phone but I think it’s beyond repairing. Couldn’t use rest of time, and the pool table had big hole in the felt so the two main amenities were not useable. They did bring us extra blankets without complaints. Overall cabin USA has and will be our go to but I think they need to do an audit on properties to make sure they are advertising amenities that can be used. My family and I had a wonderful stay! We did have a problem with the hot tub it wasn’t hot at all, so that was little disappointing, we had a guy look at it but he sadly he didn’t fit it. But other than that great cabin! We will definitely be back! I have booked through Cabins USA for the last 2 years and have been very satisfied. I the cabin was very nice, there were more than enough towels/rags. We had all the cooking utensils we needed. The T.V. 's where updated and very easy to use. I have no complaints at all. We loved our stay and the cabin. However when we were trying to cook we didn’t find any oven mitts or simple cooking tools we thought they might have. Otherwise it was great! The pros= The cabin was clean. The staff was excellent. The first night the stove wasn’t working properly. But, maintenance came out in a timely manner and it was a simple fix. No problems after that. He was a very nice young man. Loved express check in and check out. The hot tub worked great. The cons= The stairs leading up to the cabin are very steep and parking is on a slope. The cabin needs updating cosmetically, particularly the carpet. The pool table in the game room was messed up. The game room is too small to be a game room. Needed bigger pots in the kitchen to cook with. Wasn’t able to check in until 4pm. Overalll it’s a quiet, decent place to stay. Really enjoyed the cabin. Next time we will plan to stay longer. Problem with the hottub. it took a very long time to reach suitable temperature. Pool table uneven and surface damaged. Thank you to CabinsUSA for a very pleasant stay at Brentwood. We would definitely consider staying again. The cabin is minutes away from the main road in Pigeon Forge, but far enough that we couldn't hear any traffic. Very peaceful resort (booked during the week in mid-August after most schools have started). Photos and description are accurate. Our only frustration was a family of aggressive raccoons that knocked over the garbage one night. It may be best to keep the garbage cans inside during a stay. Great cabin with a huge porch that we got great use of! Resort pool is nice and big with plenty of seating and a bathroom. The room where the pool table is was small so it was hard to play pool. We really enjoyed our stay here and would recommend it! The cabin is in a great location. We watched the fireworks from Dollywood each night from the deck. Overall we had an enjoyable stay, but the cabin needs some TLC. The carpet in the upstairs bedrooms needs changed terribly; it is filthy. The floor coverings in the bathrooms need changing as well. We really liked the location, but I was disappointed with the condition of the cabin when considering the overall expense of our stay there. Everything was very nice. The only issue we had was with the hot tub. There were no chemicals in it to keep it clean. The second day we were there we realized this because the tub and water had a foul odor. I had to call 2 days in a row before someone came to fix it. Other than that, we enjoyed our stay at Brentwood. Thank you for taking the time to let us know about your recent stay in Brentwood! We here at Cabins USA strive to give each of our guests the best stay possible while vacationing in the Smokies. Each of our hot tubs are dumped filled before each guest's arrival. Thank you for choosing Cabins USA and we look forward to seeing you again soon! Time to do some updating and renovations on this propery. It is showing some sings of wear and tear. Loved the floor plan and location. I love Cabin USA! Brentwood is a great location but we got hit with critters although the trash had a lid on it. Also, there was a rip in the pool table and we were not able to play pool. Julie did a wonderful job cleaning. Thank you for all of your kind words! Our cleaners work hard to ensure each of our cabins are thoroughly cleaned and fully stocked so all our guests have to do is walk in and start relaxing. Thank you for choosing Cabins USA and we look forward to seeing you again soon! The location was wonderful though the driveway was very steep. A lot of steps to carry your stuff up. The beds are very hard. The pool table was unusable. The unit was very clean and adequately equiped. Our family really enjoyed this cabin! It had plenty of room for all the couples. The location and view is great!!! We spent a lot of time on the big deck and the kitchen had plenty of pots,pans,ect for all the cooking we did! We definitely plan on visiting again! Carpet inside and the gas grill were very dirty. The door facing on the inside entrance were hanging loose with nails sticking out. Stove eyes were unlevel because the wrong pans were in them and one eye wouldn't work. The ice maker was leaking into the refrigerator and we had a missing dining room chair. Company staff were excellent and very helpful, but this owner could do some simple repairs for the cost of this property. I will ask to see the inside of cabins beforehand. This was our 3rd time staying with Cabins USA and first at Brentwood. We will likly continue staying through Cabins USA but will probably choose a different cabin next time. Just too many steps for some of the people who go with us. Other than that it was enjoyable. We had a very nice cabin. Location was wonderful. We had a great time. I am so happy to hear you enjoyed staying in Brentwood! When you are ready to stay with us again, please mention you are a return guest for an additional discount. Thank you for choosing Cabins USA and we look forward to having you as our guest again! Great place to stay! Clean, comfy and great location! Thank you for all of your kind words! We here at Cabins USA work hard to make sure each of our guests have the best stay possible while vacationing in the Smokies. Thank you for letting us know about the toaster. We will make sure to have that replaced. When you are ready to stay with us again, please mention you are a return guest for an additional discount. Thank you for choosing Cabins USA and we look forward to having you as our guest again! The cabin was not only beautiful, but meticulously clean. 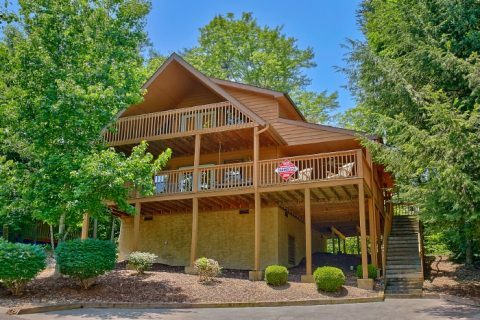 It had a great location in Pigeon Forge, which was close to all attractions. I would definitely stay here again! Thank you for all of your kind words!Our cleaners work hard to make sure that each of our cabins are thoroughly cleaned and fully stoked so all our guests have to do is walk into their cabin and start relaxing. When you are ready to stay with us again, please mention you are a return guest for an additional discount. Thank you for choosing Cabins USA and we look forward to having you as our guest again! I am so happy to hear that everyone enjoyed their stay in Brentwood! We here at Cabins USA work hard to make sure each of our guests have the same great stay you enjoyed while vacationing in the Smokies. When you are ready to stay with us again, please mention you are a return guest for an additional discount. Thank you again for your review and thank you for choosing Cabins USA! we just make many trips. to put a rocking chair on top of the can as one was there twice. There also should be instructions on how to use the Hot Tub. We haven't used anyone but Cabin USA for our reservations. Thank you for always choosing Cabins USA when you visit the Smokies. We work hard to make sure that each of our guests have the same great stay you enjoyed while vacationing in the Smokies. Thank you for your suggestions. We are always looking for ways to improve our guest's visits. Thank you again for choosing Cabins USA and we look forward to seeing you again soon! The location is wonderful! Everything was clean and we enjoyed our visit very much. Will rent again from this company. I am so happy to hear that you enjoyed staying in Brentwood! Our cleaners work hard to make sure that each of our cabins are thoroughly clean and fully stocked so all our guests have to do is walk into their cabin and start relaxing. When you are ready to stay with us again, please let our reservationists know you are a return guest for an additional discount. Thank you again for your review and we look forward to having you as our guest again! We have stayed at the Brentwood many times for the past several years. We love Brookstone Village as it's quiet but yet close enough to all the fun in Pigeon Forge. We were disappointed that on the day of check in we had to call as the air conditioning was not working and it took a couple of hours for the guy to get everything in working order.... All because the love seat had been placed against the return vent and froze everything up. Then a couple of days later when it rained one of the skylights leaked pretty bad. I hope that those issues will be fixed and other people will not have to start their vacation waiting on the air conditioning to be fixed. Other than that we had a great time and enjoyed our stay.